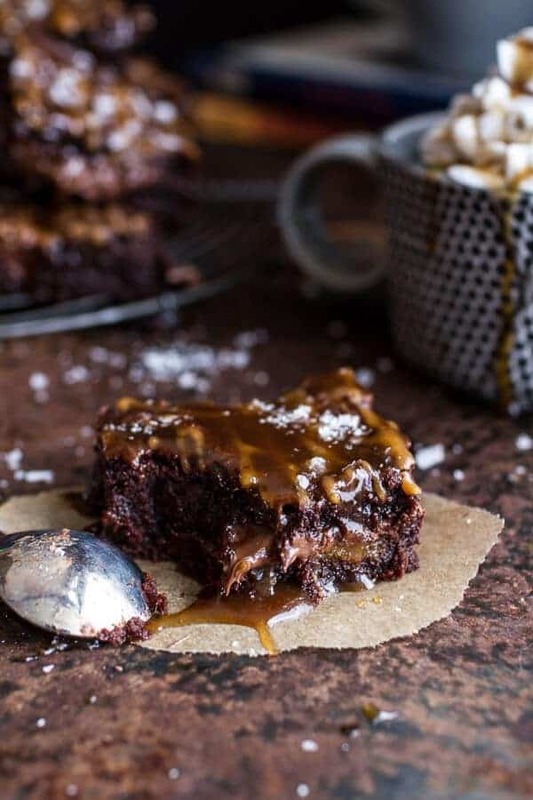 Salted Caramel Mocha + Nutella Brownies + Video. Salted Caramel Mocha + Nutella Brownies from Half Baked Harvest on Vimeo. You may have had a certain Starbucks drink with a similar flavor, but let me just be real clear here, although these brownies were indeed inspired by that famous Salted Caramel Mocha drink (that come fall people go crazy for), these brownies I am showing you today are a million times better than that drink could ever be (that has GOT to be a run on sentence!). Believe it or not, I have never actually had a Starbucks drink. Not even those famous Pumpkin spice lattes. I feel like this is a little crazy, since it seems like most people in the world live off of Starbucks, but I don’t drink coffee, so it has just never interested me. When I was middle school though, I always wanted the Christmas cups from Starbucks that I would see people carrying around. I thought they where the coolest. And not gonna lie, I still do, I am a sucker for anything involving Christmas. It’s bad. And speaking of Christmas, these brownies would be PERFECT for the month of December. I know we are still a few months off, but I am just stating the fact. Also, how is it that Christmas is only 89 days a way (yep, I looked)? That is just too soon. Way too soon. I am not ready for this year to be over, it went so fast. PLUS, I feel like the barn is never going to be done on time. We are still shooting for Thanksgiving, but oh my gosh there is just so much work to be done in the shortest amount of time. Too much work. Everyone is extra nervous about it. Me especially because, hello I am dying for it to be completed already. I am just praying we do not get any early snow storms that will set us back. As crazy as snow in October sounds, it happens here – often. Here is the deal with these brownies. They are decadent, but who doesn’t love a little decadence come fall? I have all these apple and sweet cinnamony pumpkin deserts that I want to share with you guys. Think like two whole pages full of apple/pumpkin recipe ideas. But then the thought of brownies took over in my mind and there was no turning back… and really fruits can never make a dessert like chocolate can. So maybe apples + pumpkin next week? 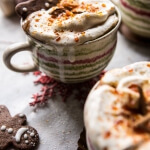 Originally, I wanted to share this recipe in December, but I bumped it it up a couple of months because, well I really just could not wait to make them. And when I called my mom for advice on whether to make extra sweet chocolate brownies or apple pie she obviously said brownies. Chocolate always wins. I am on a huge salted caramel kick (or a cinnamon kick or a pumpkin kick… it depends on the day). I really want to make everything with some kind of caramel. Caramel apples, caramel brownies and pretty much anything chocolate, but then covered in caramel. I didn’t even used to like caramel, especially caramel apples because they were too hard to eat (I swear I had braces forever! ), but I have clearly gotten over this, as I am going caramel crazy over here. 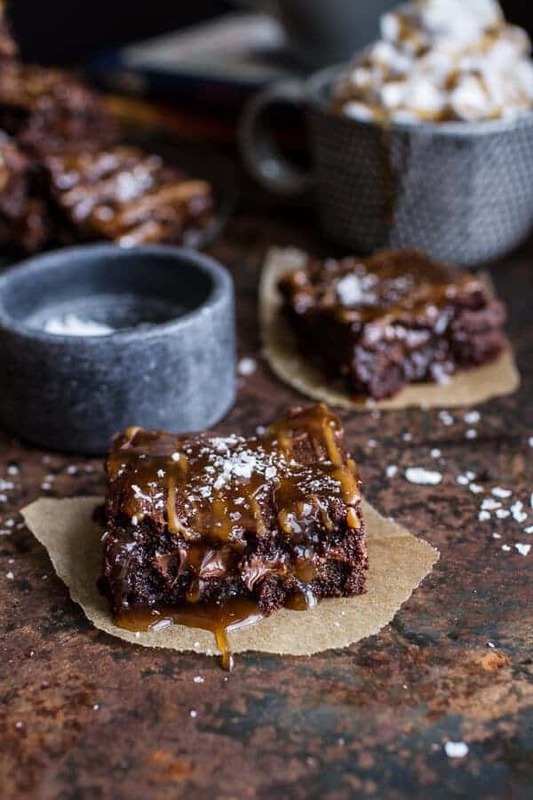 Ok so, these Salted Caramel Mocha + Nutella Brownies are pretty simple. 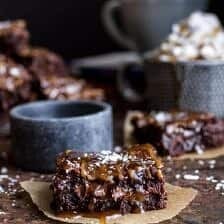 Meaning they do not take a whole lot of time to prepare AND if you are really desperate for a chocolate caramel fix, you can totally eat these while still warm. Preferably with a semi-giant scoop of vanilla ice cream (always). I actually allowed mine to cool. I know, you probably do not believe me. Trust me, it was hard. So hard, but I wanted pretty brownie squares, so I waited. Err, well actually my patience got the better of me and I ended up sticking the whole pan in the freezer to get them to cool down faster. It worked like a charm, but you just cannot forget about them. Going back to a frozen pan of brownies is not fun. No fun at all. I made a quick coffee caramel sauce that I spiked with Kahlua because, well, why not? It’s Friday, it’s officially fall and those are the only two excuses I need. Plus, Kahlua rules in my opinion. This is actually the sauce I used last year for this skillet cookie. Don’t be afraid of making this caramel, it’s pretty basic. You can definitely use a store-bought caramel sauce, but this coffee caramel really plays up that whole mocha theme going on here. Plus, homemade is alway better if you can. And finally, aren’t you excited this is only the BEGINNING of fall? 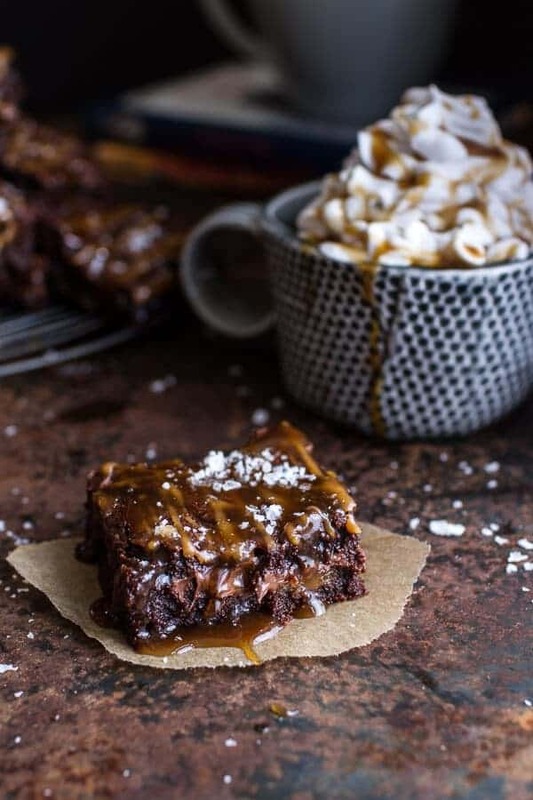 Salted Caramel Mocha + Nutella Brownies. To make the the caramel add the coffee and brown sugar in a medium sauce pot. Bring to a boil and boil 5 minutes or until the mixture has reduced to 1/3 cup. Slowly add the coconut milk and butter, whisk to combine. Bring back to a boil, reduce heat to a low boil and cook 5 minutes longer, until the sauce has thickened and coats the back of a spoon. 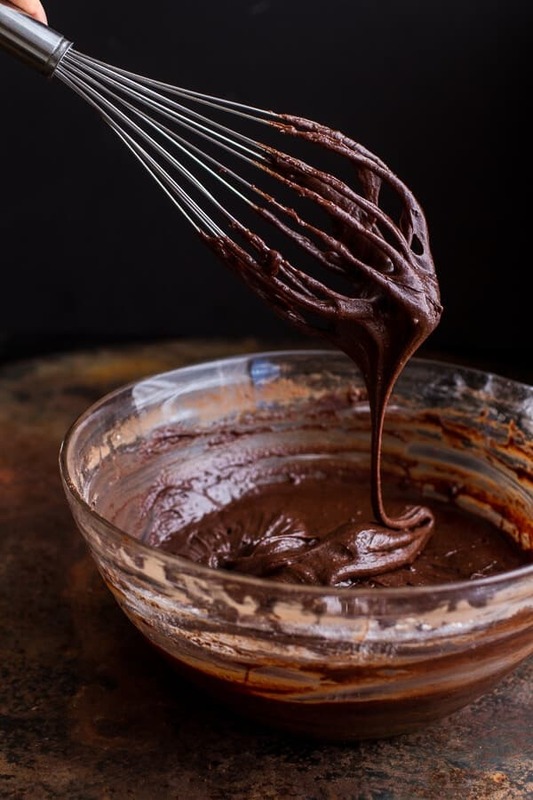 If using a candy thermometer do not let the sauce go above 180 degrees F. Remove from the heat and stir in the Kahlua and a pinch of salt, set aside. To make the brownies. Line an 9x13 inch baking dish with parchment paper or foil, letting the edges over hang from the pan so later you can easily lift the brownies out of the pan. 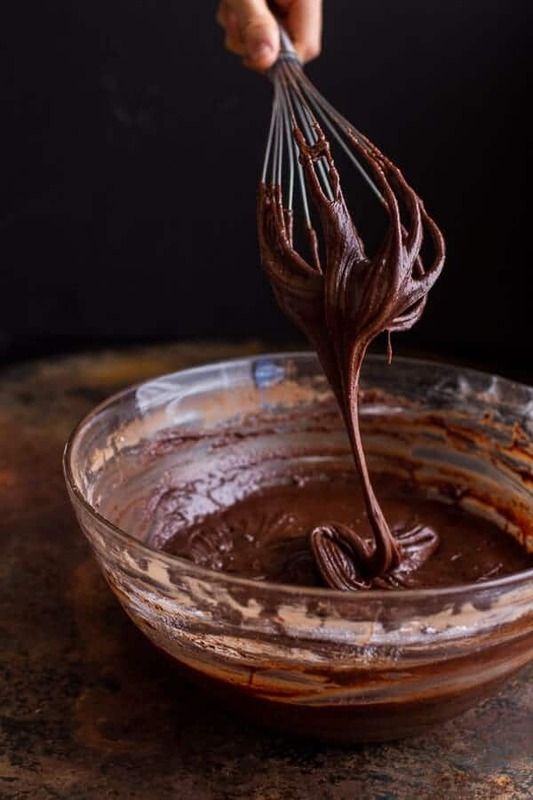 Preheat the oven to 350 degrees F.
To the melted chocolate mixture add the sugar and instant coffee, whisking until completely combined. Add the vanilla, Kahula and eggs and whisk until smooth. Stir in the cocoa powder, flour and salt until smooth and just combined, try not to over mix the batter. It will be thick. Pour half the batter into the prepared pan. Dollop teaspoon size amounts of Nutella over the batter. Drizzle with three-fourths of the caramel (you may need to warm the caramel over the stove if it has set). Spoon the remaining batter over top, using a spoon to lightly smooth out the batter. It's ok if the batter does not cover up all the Nutella + caramel. It means there is so much more of this to come + boat loads of apples, pumpkins and caramel too! 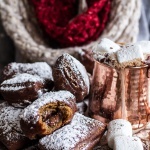 Gingerbread Surprise Beignets with Spiced Mocha Hot Chocolate. OK it’s Friday morning and I would rather make brownies instead of going to school–LOL. Thanks Nancy and I hope you are having a great weekend! These brownies look ooey, gooey and delicious. They look messy, but I’d lick the countertop clean. BTW, where does one find a counter top that looks like a rich, gooey brownie? My sister sent me your webside on Facebook for your Toasted Coconut and Chocolate Chunk ROASTED Banana Bread. Can’t wait to make it, better yet; can’t wait to eat it!!! I feel like you just started a new sensation with these. Such an awesome idea! Oh my these look too good to be true!! 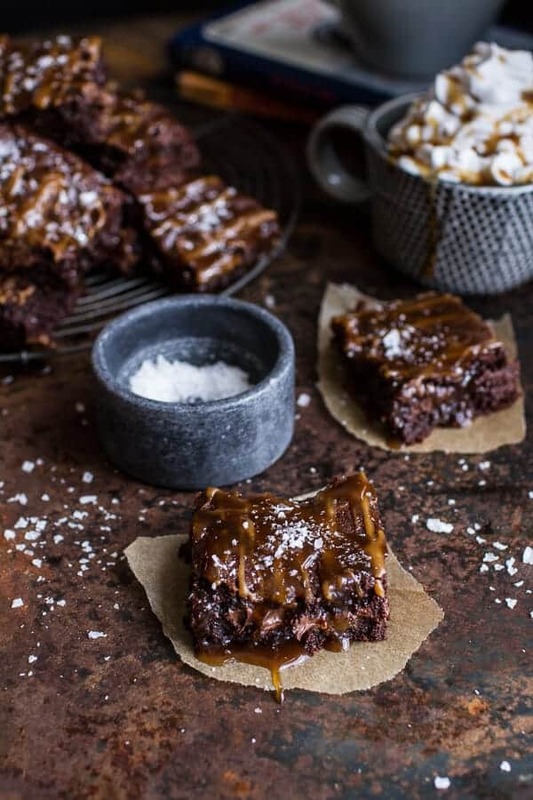 Addicted to salted caramel so must give these a go! WOW!!! Death by chocolate I would say. HAHA!!! They look delicious. Thanks Charlotte! Hope you are enjoying your weekend! Whoa these are decadent. I am so making these for a Fall “thing” I’m going to next week. Thanks Norma! They are perfect for “fall” things! 🙂 Enjoy! Salted coffee caramel!? If I was a recovering caramel addict I’d be relapsing right now! This is everything! Homemade caramel is my life. So glad you shared this recipe! Those brownies look absolutely delicious! Thank you! Hope you get a chance to make them and love them! I like your mom. Chocolate DOES always win. I have learned this many times in my 24 years on this earth. And, these brownies, do you ship? Cause I want 30! Pinned! Totally love the way you think! Thanks Taylor and I hope you are enjoy the first weekend of fall! It’s 8 tablespoons or 113 grams. Thank you so much, Jessica! There is 8 tablespoons (1/2 cup) in one stick. So there is a total of 16 tablespoons or 1 cup of butter. I hope that helps and please let me know if you have any other questions. Enjoy! Whaaat??? These look INSANE!! I think my chocolate loving husband would DIE for these!! I can;t wait to make them! You said brownie? I’m in! What a fabulous combo. Enjoy the first glorious weekend of fall! So gooey and chocolaty! Love! Oh man, these are INTENSE! Love it! Obsessed with any baked goods that involve flaky salt. Isn’t flaky salt the best? My dad hates when I salt dessert, but i cannot help it. So good! Thanks Laura! Hope you are having fun in NYC! these have all my favorite things and it’s packaged in one of my favorite sweets – HELLO! Thanks! Hope you are enjoying the first weekend of Fall! Whoa! 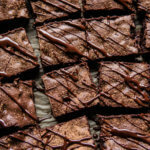 These brownies are making my chocolaty dessert dreams come true! I like the way you think! Your brownies look a-mazing, and the flavor combination is perfect! Yea, so I believe these must be made this weekend – they look toooo good! Please let me know if you do make them, Kathy. Hope you love them! These look like such a messy-delicious dessert. The kind that stick all over your fingers and “oh no!” you have to spend the next ten minutes licking caramel off of them. YUM! Wow! 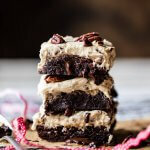 These look like a deliciously gooey brownie! Brownie are a big weakness of mine! Dying over these gorgeous photos. The caramel drips and ooey gooey chocolate are making me swoon! Pinned! 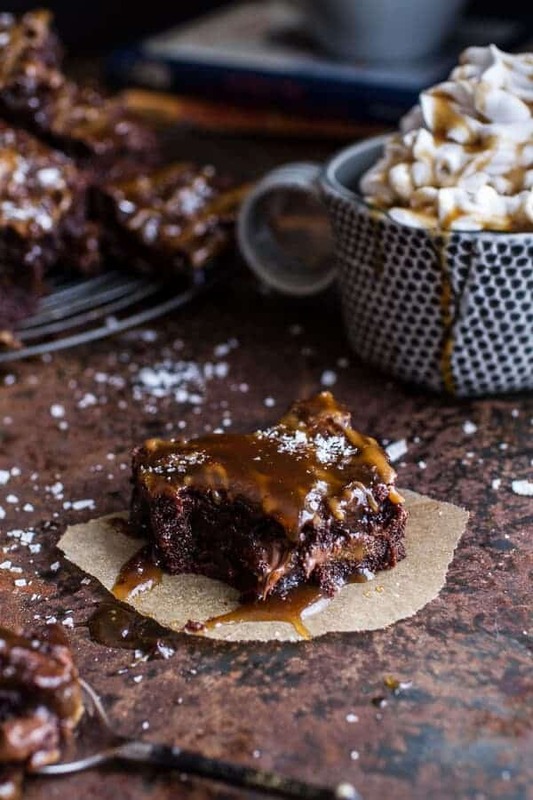 That drizzle on top of these brownies are AMAZING. I’d go for chocolate, any time, any day! hubba hubba. So many of my favorite things. Even during fall, chocolate always wins over apples in my book! Thanks Katie and I hope you are enjoying the first weekend of fall! 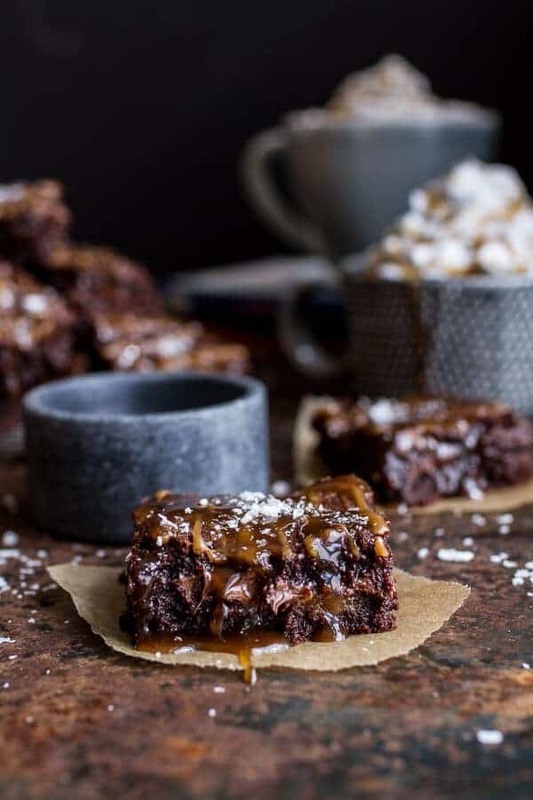 These look amazing, I love the idea of coffee in the caramel! Thanks so much, Sarah! Hope you are having a great weekend! Okay. So. I have been following (stalking?) your blog for a little while. Silently. But, I am breaking that silence to say that you are officially my favorite person. First, the amount of creativity you have in the kitchen is bananas. Second, your photography is on point. So gorgeous. Third, I too have never had these iconic Starbucks drinks and feel like a total outcast. coffee is meant to be black imo. But I seriously want to go get one just to have the cup and feel cool, ya know? Holy wow… I think I just died!! These are incredible. Thanks so much, Tessa! Hope you are having a fun weekend! Hope you are enjoying this fall weekend! Those look AWESOME!! Absolutely love your blog! & your pictures are amazing! Thank you so much, Jordi!! 🙂 Hope you are having a great weekend! These look so over the top delicious and gooey I think I’d need to eat the whole pan with with a spoon. Washed down with a gallon of milk. HEAVEN! Just holy cow. I love you Tieghan! Omg these look ridiculously amazing!!! I wish I had some with a glass of milk right now! Thanks Julie! And yes to that glass of milk. It is needed! These look stunning. Making these pronto! Yeahhhhh when I make these, there is NO WAY I could wait until they’re cooled to eat them. I’m digging right in with a fork! Okay, I think you just made a batch of brownie heaven, it can’t get any better than this! You’re right. I’ve never met a brownie like these before. I really want to though. Thanks Jenna! Hope you are enjoying your weekend! Adding these to my must-try list! It’s like you took my wildest dessert dreams and made them a reality. Fabulous! Oh man, I now am craving chocolate. 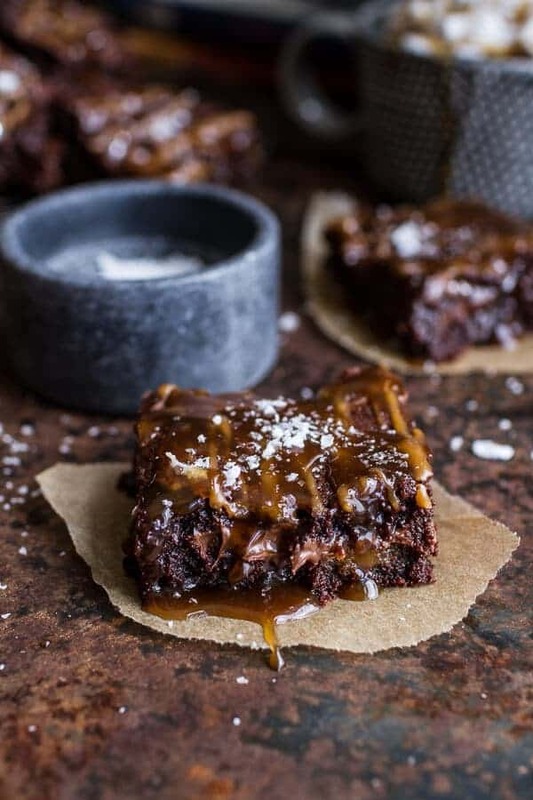 And I still have some salted caramel sauce in the fridge…I am seeing these in my very near future…like, 30 minutes. Lovely, Tieghan! Thanks Meg! Salted caramel is a dangerous thing to have around…a very good dangerous thing though! OMG! It’s Mouth Watering Tiegha. Decadent is right. I was practically drooling while reading this post. Love your photos. This recipe is perfect for a special occasion knock your socks off dessert. Thank you so much, Rachel! Hope you and your family had a great weekend! These look insanely rich, decadent, delicious and perfect for fall. I would love it sweets could just appear upon craving. So amazing!! Just made these…..omg my mouth is watering just thinking about them. Soooooooooooo good!!!! YAY!! So excited you are loving them. Thank you! Hi! Just leave the instant coffee out, no substitutions needed for the brownies. For the caramel, you sub water, apple cider or bourbon. Hope you love these brownies and please let me know if you have any more questions. Hey Sue, my guess is that you just need to let the caramel cool down a little and it will thicken as it cools. Did you allow coffee to reduce down to about 1/3 or 1/4 cup, then add the remaining ingredients? It’s hard to tell what could the problem not being there, did you taste it? Does it taste like caramel? Hope I can help you fix this, sorry for the trouble! I had the same problem. I boiled it for about 30 min before I gave up. Since I didn’t have all day, I made the brownie batter meanwhile so the caramel never had a chance to cool. Hope that wasn’t a crucial step! It’s no big deal as long as the tasted good! Holy chocolate! Made these this week and EVERYONE who tried them couldn’t stop saying how delicious they were. Best brownie ever! Thanks for the recipe. YEAH!!! So happy they are a hit! Thanks! 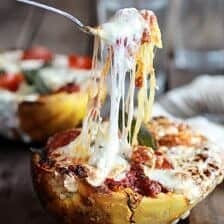 Question–I plan on bringing these to a thanksgiving potluck. 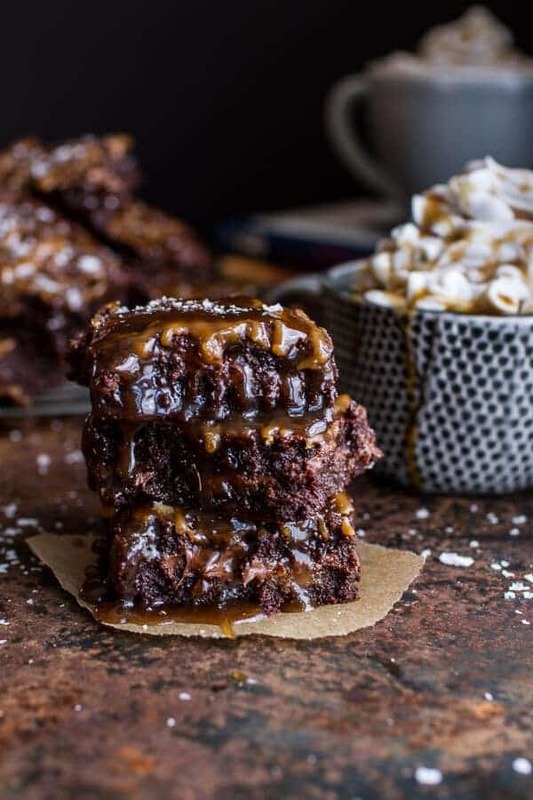 Can I pour the caramel over them beforehand, slice, and serve after a couple of hours, or do you think it’s best to reheat the caramel to pour over the bars right before I serve them? I think either would be great! If you want them slightly warm, I would re-warm the caramel, but if you don’t care just pour the caramel over the brownies before hand. Both are very good! Hope you love the brownies! Hello- If I make these a night a head will they be okay or will the caramel that is in the batter not do well? I was thinking I could make the brownies and save the caramel for tomorrow to heat and put on before the event I am attending. Making them ahead works great. Hope you love these and please let me know if you have any other questions. These brownies are amazing!!! I made them for a Super Bowl party this past weekend and brought the leftovers to work on Monday. They have universally been declared some of the best brownies ever consumed. I thank you (and curse you) for the recipe! The caramel sauce did take me significantly longer to make (took forever for the coffee/sugar mixture to reduce to 1/3 cup) but was worth the effort! So delicious! SO happy you loved these! THANKS! Love the sound of this recipe and I want to make it for my ladies’ group. However we have one person who is allergic to gluten. 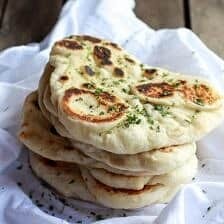 Any way to make these gluten free? Hey Renee, I think that if you use a gluten free flour blend that should work great! Thanks so much! I will try that and let you know how they work out! your site is great your pics are great- just some advice, take more pics of the process, and less pictures of the finished product unless you get creative and stop taking them from all the same angles. SERIOUSLY IT’S SO BORING. I was lead here by your picture. 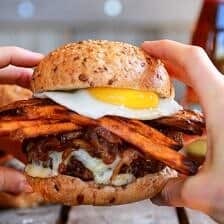 Whomever takes your pics, is a very distinctive photographer because when I saw this recipe I told my son “It looks like that messy BBQ pic/recipe I tried a few months ago.” Low and behold..I was right! Miss T…you are young but you got it going ON! 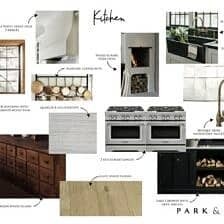 I love your site, your recipes and you definitely have your own vision. Lots of Love from DC! It’s Valentine’s Day and I’ll be making these for my one true love…ME! Because as Rupaul says, if you can’t love yourself, how in the he** are you going to love anybody else? Looks great. Quick question, Is the coconut milk in the recipe the sweetened coconut milk or the unsweetened variety (like what’s used in Thai cooking). 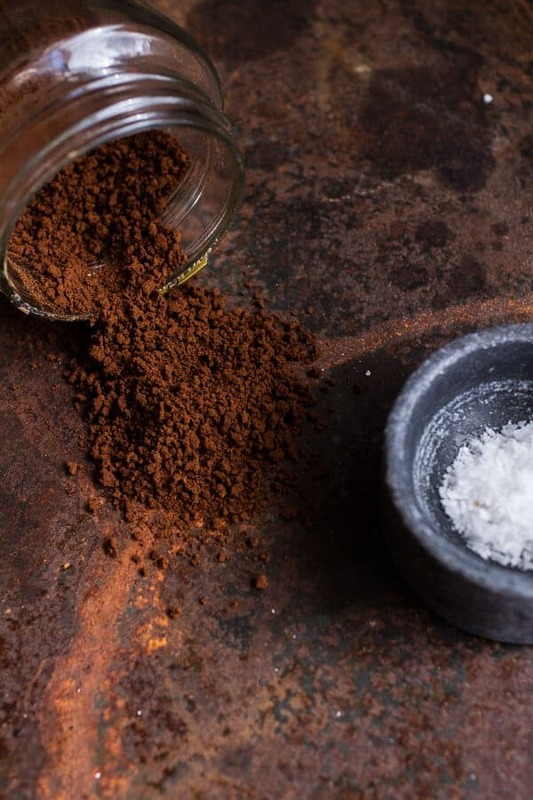 1) When you say instant coffee, are you referring to the granules, or should I prepare the coffee first? 2) My boy really likes dark chocolate. Could I substitute it for the milk chocolate, or would that be too overwhelming since it already has cocoa powder? I use the granules (unprepared) and yes, sub whatever chocolate you love! Dark will be great! WOW, i cant wait to try these!! 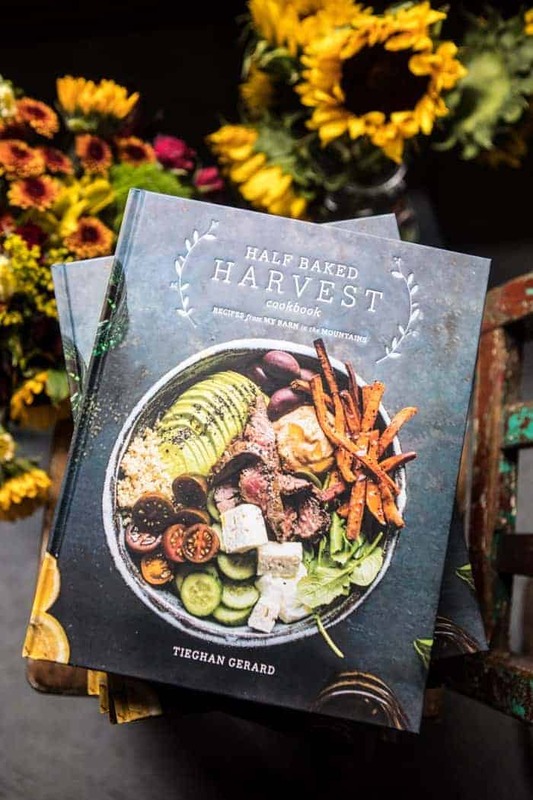 I’m making these today for my Cookbook Club, wish me luck! Totally don’t get they caramel sauce – 2 cups liquid to 1 1/4 sugar? Mine was so runny and never coated the back of the spoon. I added more sugar, cooked it longer, never thickened, just got darker and darker. I’m an experience cook, but I check my Fanny Farmer cookbook and none of the sauce recipes have anywhere close to 2 cups of liquids. Is this a typo? Hi! I am sorry you are having trouble. Did you reduce the coffee down to 1/3 cup in the first step? The recipe is correct as written so the only thing I can think is that you either skipped reducing the coffee or just did not boil it long enough. It also thickens greatly as it cools. Hope I can help and sorry for the trouble! My husband made these for me last Mother’s Day and now they are my must-have Mother’s Day dessert. Your brownies are the BEST that I have ever had — I couldn’t resist going back for seconds. Thank you for sharing such a delicious treat with all of us! Wow! Thats so awesome!! I’m so happy you like them! Happy mothers day! I made these for my mom on Mother’s Day. They were a HUGE hit! Exactly what mom wanted on her day. 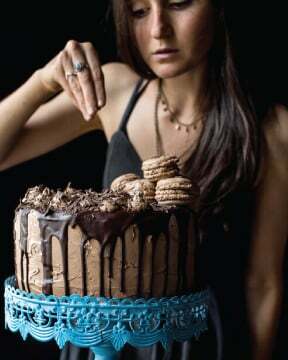 Thanks for putting together such a fun/decadent/wonderful recipe. My caramel was a little runny… It cooled down to a thicker consistency, but I was a little nervous while making them that I’d drown the batch in brown sugar coffee…! YES!! I’m so happy they were a hit! Thanks so much Bailey! Wow! This has got to be one of the best brownies I’ve ever had. Very thick, rich & decadent! Made for the kids on our movie night (watched Batman vs. Superman by the way) And they loved this recipe. I did have trouble with the coffee caramel, but not from your recipe, but from me… i should have got it to the boil like in step one and as shown in your video. and i should get a candy thermometer. But the taste of that caramel is out of this world amazing!!! Will definitely make again. My daughter and I made these over the weekend. They didn’t turn out as decadent as shown. Nor as gooey. More cake-like. What did we do wrong? HI! It sounds like you possibly over-mixed the bater. That can lead to a dry and cakey brownie. Let me know if you have questions. Sorry for any trouble! Hi, this is so crazy! I’m supposed to be on diet but I happened to glance at your post while eating a juicy sweet California navel orange and I said to myself, “oh, I need to make this”! So I will make this next week! When you said Kaluah, what exactly is that? Thank you so much for sharing your wonderful recipes! Hi! Kaluah is a kind of liquor. You can omit if you’d like. Let me know if you have questions. Hope you love these. Thanks! These are amazing… a couple of thoughts. I followed the recipe to a T. The caramel sauce took almost an hour to get reduced… it was delicious, but took a lot more time than the recipe stated. Because of this I didn’t have time to let them cool as much as you said – we made them for a birthday and had to leave 🙂 So they were good, but I was kind of unsure if all the effort had been worth it. But the next day they were beyond amazing. So the cooling really is key. My friends still ask about “those brownies”. So sorry it took longer than expected! I am so happy they were still really good!! Thank you for making them Marlen! Wow, these are one of the best brownies ever. They have the perfect texture and the taste is amazing. Made them yesterday afternoon and by evening almost all of them were gone, that’s how good they are. These are my favorite!! So happy you enjoyed them as well!! Thank you Pika! Can you brew regular coffee and use that instead of black coffee? And also can I leave the Kahlua out from the Caramel sauce? Thanks! Regular coffee will be great. And yes, you can omit the Kahlua from the recipe. Let me know if you have other questions. Hope you love the brownies! The video doesn’t seem to be working for me (and it’s the same for a few other recipes I clicked on from the “videos” page. Hi I was wondering if you could make this without flour? These sound delicious however am gluten free. The caramel never thickened up. Though disappointed, I moved forward and baked the brownies without the caramel. So sorry about that Lauren! Can I help you with what went wrong? Let me know! What would be the best way to prepare these ahead even by a couple hours? Can I cook these, cool them and than warm them back up?